SpongeBob SquarePants Stickers are amongst our wide selection of stickers for kids. 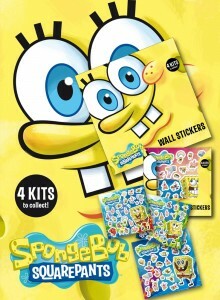 There are 4 whole kits to collect, which each feature bright, colourful SpongeBob wall stickers. This energetic cartoon character will be brought to life when you decorate a room with these stickers. Did you know that we use the very latest inks and technology to ensure that the vibrant colours remain vibrant- no matter what length of time they’re on the walls. If you don’t fancy sticking them to walls you can put them on windows, furniture and many other surfaces too! There is no need to worry about the stickers leaving a mark too, as they’re completely removable and reusable which means you can change their position as you wish, and keep your decor in great condition. Children love to play with stickers and as a parent it’s nice to know that the stickers are made from high-quality material meeting British standards – that’s what we pride ourselves at Rowan Stickers. So if you’re children are fans of SpongeBob SquarePants, these stickers will make their day! There’s plenty of selection to choose from, providing hours of fun. Our customers think that they really make a difference to homes, schools, nurseries or children’s waiting areas. Why not give it a go and get creative? You’ll love our SpongeBob Stickers as much as the kids!